Thank you for your interest in wanting to learn more about us. We are Lory and Malcom, and together we own and run, Mallorys Tocino. Please read through the information below. If you have any questions, please contact us. We are all about great tasting jerky products and old fashioned friendly service. 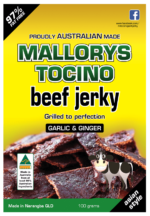 Mallorys Tocino Jerky is a family run business located at Narangba, Brisbane. Lory and Malcom have perfected their traditional jerky recipe to produce moist, tasty meat jerky in a variety of flavours. Being 97% fat free, it is an ideal healthy snack for all occasions. – road trips, before or after the gym, camping, parties or even to pop in the kids lunch box. You can purchase your choice of jerky flavours directly on this website, where you will find 100g bags of chicken jerky and pork jerky. For the true beef jerky lovers, besides 100g bags of beef jerky, you can purchase them in 300g, 500g and 1 kilo size packs. The larger packs are discounted, therefore, if you truly love beef jerky, it makes total sense to buy the larger packs. Lory and Malcom supply many local businesses around Brisbane, Caboolture and the Sunshine Coast. You can see the full list on their stockists page. Find Mallory Tocinos’ jerky products in stores such as selected IGA, Food Works, Butchers, Fruit Shops and more. If you would prefer to see the products before you buy, Mallorys Tocino Jerky can also be found at many local markets. Catch us at Eumundi Markets, Caboolture Markets, Carseldine Markets and more. A bit about the origins of our meat jerky. The meat jerky originated on the tropical island of Cebu, Philippines. It is a traditional, secret, family TOCINO recipe passed down through the generations. Malcolm and Lory brought the family jerky recipe to Brisbane, Australia and established, Mallorys Tocino Jerky. In the past, the traditonal cooking process involved hot charcoal and to get that perfect dry texture the tocino jerky was dried on the rooftops in full view of the sun. Lory and Malcom have adapted and perfected the secret recipe using a more modern process and equipment. Our jerky is made of thin slices of lean raw meat, which is marinaded in a mixture of salty, sour and sweet ingredients that adds the moist and pleasant bite of flavour. The jerky is marinated with Asian herbs and spices for 24 hours and is air dried, grilled and sealed for perfection. WHY TOCINO JERKY, and not just JERKY? Our jerky has a long shelf life in an air tight seal and is best kept at room temperature. All of our chicken jerky, pork jerky and beef jerky is 97% fat free, and is a great source of protein. Our customers have told us, we have the best jerky in Brisbane. Best jerky in Caboolture. Also the best jerky on the Sunshine Coast. Through our website, we know have the ability to reach customers Australia wide. It’s our aim to hear our customers say, we have the best jerky in Australia! Feel free to read our customer reviews, and if you try our jerky flavours, send us your feedback. Let us know what you think, and your favourite flavour.